The transition to pre-kindergarten or kindergarten is not not always easy. Children and parents may experience some anxiety about the upcoming changes. Therefore, it is important to prepare children in advance. 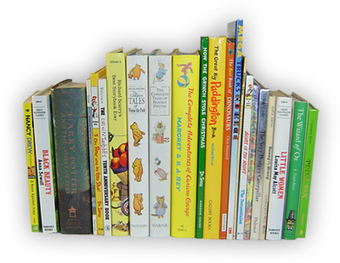 Below is a list of children's literature that may support this transition. Annabelle Swift, Kindergartner, by Amy Schwartz, (1988)-Annabelle is getting ready to start kindergarten, so her older sister gives her some advice. Berenstain Bears Go to School by Jan Berenstain, (1978)-The Berenstain bears are off to school and have many fun adventures. Chrysanthamum by Kevin Henks, (1991)-Chrysanthamum is a mouse who loves her name. She learns to ignore the other mice who think her name is silly. Do You Want to Be My Friend? by Eric Carle, (Harper, 1987). This book shows how Little Mouse seeks and eventually finds a friend. Francine's Day by Anna Alter, (2003). Francine Fox is a grumpy, stubborn kindergartener who doesn't want to do anything. She argues about getting out of bed, eating breakfast, and even going to school. After spending the day in kindergarten, her teacher, Mrs. Wendell, helps her to have a more positive attitude about things. Kindergarten ABC by Jacqueline Rogers, (2002)-It's "A" day and a class of kindergarten students is searching for acorns. On B day they bring their backpacks. Learn the ABC's of kindergarten with this classroom of children as they go through each letter of the alphabet. Readers can play the search and find game for every letter on each page. Miss Bindergarten Gets Ready for Kindergarten by Joseph Slate, (1997). Miss Bindergarten is preparing her classroom as her soon- to-be students awaken and anxiously prepare for the first day of school. My Teacher Sleeps in School by Leatie Weiss-Because Mrs. Marsh is in the classroom when the students arrive and leave for the day, they think she lives at school. They even find clues in the classroom that make them believe their teacher’s home is school. But where does she sleep? Ruby the Copy Cat by Peggy Rathman, (1991). Ruby doesn’t know how to make friends at her new school, so she mimics what others do. She finally finds her own way to be friendly. Tiptoe into Kindergarten by Jacqueline Rogers, (1999)- An eager preschooler tiptoes into her older brother's classroom and finds out what kindergarten is all about. She looks forward to the day she will go there after her wonderful experience at school. We Share Everything! By Robert Munsch,(1999)-Amanda and Jeremiah have a problem: they both want to play with the same blocks and it's only the first day of kindergarten. Their teacher repeats the same words all day, "In kindergarten we share. We share everything." Amanda and Jeremiah take this lesson one step too far and the class is in for a hilarious surprise. Welcome Roberto! Bienvenido Roberto! by Mary Sefozo, (1969)- The story of Roberto’s first day at school is written in both English and Spanish. When You Go to Kindergarten by James Howe, (1994)- Children can learn what to expect from school in this comforting book. Will I Have a Friend? by Miriam Cohen, (1967)- During Jim’s first day at school, nearly everyone seems to find a friend. In the end, so does Jim. Willy Bear by Mildred Kantrowitz, (1989)- A child prepares for the first day of school with his stuffed animal. When school time comes, he leaves the animal behind.